Founded in 1990, Church of the Resurrection is the largest United Methodist Church in the U.S. In 2012, HGA joined Church of the Resurrection’s mission to create a permanent sanctuary at their 76-acre Leawood, Kansas, campus. Design for the new 140,000-square-foot main sanctuary and support space began in November 2012 and was completed in March 2017. Projects such as this, with demanding design challenges, often provide new opportunities for innovation that result in very rewarding engineering solutions. The Church’s desire for an intimate 3,500-seat, lofty, naturally lit sanctuary provided many such challenges. The team was able to manipulate the building structure and design software to work within the confines of the complex building geometry. The sanctuary warranted an economizing design of long-span roof trusses and occupant comfort-driven design for shallow depth cantilever balcony trusses. The non-orthogonal building shape necessitated a practical lateral load application and analysis process for design wind loads. The team’s mindful placement of braced frames within the architectural form created a discontinuous lateral load path to reconcile. 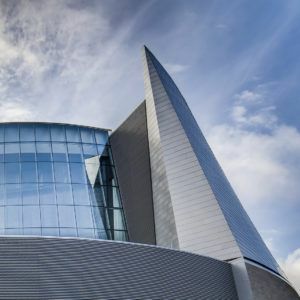 HGA structural engineers elevated their thinking and developed innovative solutions to meet the challenge of making the sacred vision for this building a reality. This was accomplished by creatively analyzing irregular diaphragms, accommodating slanted columns, and developing appropriate structural steel backup design criteria for the stained-glass window. Read the complete article in Structure Magazine. 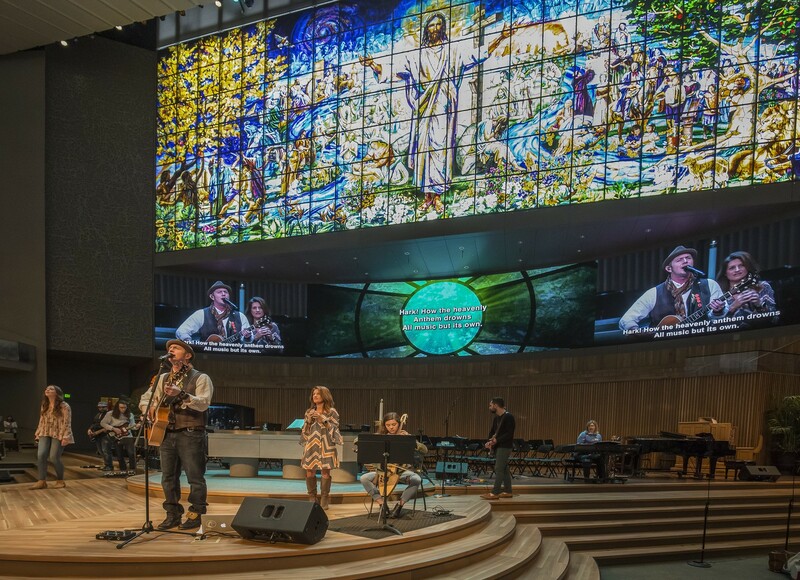 The sanctuary gave structural engineers an opportunity to provide expertise for an extraordinary element—the largest stained-glass window installation in the world.